Empire Farm Days August 11-13. Geneva, NY; August 5, 2015. 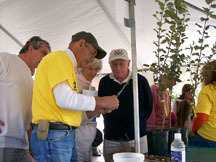 Scientists from the Agricultural Research Service Plant Genetic Resources Unit, Geneva, NY, will demonstrate grafting techniques used with apple trees and grapevines daily at 11 am at the August 11-13, 2015 Empire Farm Days at Rodman Lott and Son Farms, 2973 State Route 414, in Seneca Falls, NY. The ARS scientists will show how rootstocks affect fruit quality, change the shape and productivity of the tree scion, or top, and how scion traits can be modified by different rootstocks. Empire Farm Days is the largest outdoor agricultural trade show in the Northeastern United States with more than 600 agricultural exhibits, demonstrations, seminars and displays. ARS is the chief scientific research agency of the U.S. Department of Agriculture. The mission of the Plant Genetic Resources Unit is to maintain, characterize, and distribute plant genetic resources of selected fruit and vegetable crops to develop new hardy varieties that can stand up to pests, diseases and environmental stresses. The unit has more than 2,500 varieties of apples, including some that are as familiar as the local supermarket produce section and others from distant and exotic locations. 0 Comments to "Wayne County Apple Growers: USDA to Offer Apple & Grape Grafting Demos at Empire Farm Days"